The future is now with the Kodak 9000 3D System. The Kodak 9000 allows us to identify and evaluate situations in the oral cavity and jaws that we could only assess previously with a 2D image. The capability to distinctly observe a severely impacted third molar and the proximity to the inferior alveolar nerve or to view impacted maxillary canines somewhere in the upper jaw is an advantage that was unheard of in the past. The scanner is also critical in the preoperative evaluation of the type and amount of bone available for implant placement. Our ability to correctly measure, in a real-life situation, the amount of bone available in all 3 dimensions gives us the opportunity to place implants in an area that we may not have thought possible. 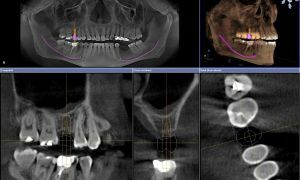 This feature has revolutionized implant treatment planning to the point where CBCT technology is becoming the standard of care for implant placement. Pathology is also better evaluated in a 3D format and more accurately predicts the amount of surgical intervention necessary. We are excited about our CBCT scanner and greatly appreciate it’s value for continually improving patient care.